RATHER THAN DWELL ON HER ATTRACTIVE DEBUT STUDIO ALBUM title What A Woman Shouldn't Do, Julie McKee is determined to show what she should do. Or rather, what she does  and she does it so well. Her voice is quite distinctive and the album consists of eleven original songs that are all her own work, dancing merrily with the retro echo of cabaret. Julie McKee has some serious quality to her voice; she has a deft way with lyrics, and she plays piano brilliantly. Think Randy Newman played with a Tori Amos feel and a slap of Ben Folds irreverence and you're almost there. A smart, musical mix of pop, soul, rock, blues and classical that's being played by radio all over the UK, in Australia, and in the United States  where she's already charted at No 1 on Que FM. What A Woman Shouldn't Do is a collection of songs drawn from Julie's experiences of life in a big city and her fascination with the foibles of others. The resulting musical vignettes are full of wit and compassion, taking tender snapshots of friendships at breaking point, humongous egos and self-appointed television experts. They tell a host of stories and extract a string of emotions. The feelings that Julie puts into her art are laid bare for all to savour. An Australian brought up in the States and now living in London, you won't be surprised to hear that Julie is a classically-trained pianist with a Masters degree in jazz studies from the Guildhall School of Music & Drama. Her musical influences are many, taking in pop, soul, rock, blues and classical. You can identify them all  and more  on What A Woman Shouldn't Do. Julie says: "I listen to all kinds of music and would hate my songs to be described simply as one genre. To me, good music is good music, wherever it comes from." Having been performing professionally for a couple of years, Julie McKee is at last getting recognition with her album. She's being playlisted and interviewed by radio stations all over the UK, is being picked up in Australia and  within a week of going live on America's Que FM on 23 April  she had charted at number 2 before making Number One. Station DJ Airomee Wind is on record saying that Julie's single, Angel Song, is truly "a modern-day marvel". With the modern trend of taking the good things from classic music and personalising them, Julie McKee is standing out as an artiste in her own right with a truck-load of innovative songs to ensure there is enough to keep the wheels oiled for a promising future. 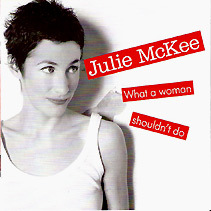  What A Woman Shouldn't Do is Julie McKee's debut studio album of eleven songs and it will be released on 16 June (online). Julie is playing dates in May and June ahead of a full-band album showcase in London on 2 July (see below*). A UK tour will follow. Tracklisting: 1 Nobody's Farm | 2 All About You | 3 Eric Marlow | 4 Carousel |5 It Just So Happens | 6 The Experts | 7 Summer Weather In My Heart | 8 Nine Years Old | 9 Mount Vesuvius | 10 Angel Song | 11 What A Woman Shouldn't Do. * Julie's album showcase for What A Woman Shouldn't Do will take place in London on 2 July (2008) from 7pm until late at The 606 Club, 90 Lots Road London, SW10 0QD (Tel: 020 7352 5953). The closest tube is Fulham Broadway. Her showcase will feature  Julie McKee: Vocals, Piano and Wurlitzer | Simon Little: Bass (Divine Comedy, Ben Folds) | John Blease: Drums (Newton Faulkner) | Nigel Price: Guitar (James Taylor Quartet) | Rob Gentry: Hammond, Rhodes (Lazenby) | and Steve Rubie: Alto Flute (and owner of this legendary venue). Check out www.606club.co.uk for full details.